I had to drill a bunch of 1/4″ holes for the counterbore pins for the base of the kitchen island. The base is constructed from white oak. I drilled the first few from the 1/4-inch forstner bit I had on hand. The bit quickly heated up and dulled. I ordered a 1/4″ carbide tipped brad-point drill bit from Lee Valley. The drill bit arrived on Friday, and yesterday I completed drilling the holes out for the counterbore pins. The 1/4″ bit was $19.70+shipping, and was worth every penny. The bit didn’t overheat, and cut amazingly clean holes. I’ll be adding to my collection of carbide-tipped drill bits as I need them for projects. I don’t want to put out the money for a full set of the bits right now, so I’ll get them one at a time. 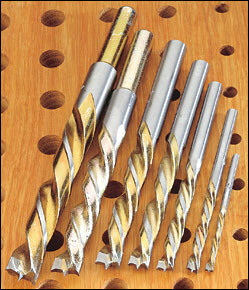 Also, these are only designed for drilling in wood, and won’t be used for general household use.